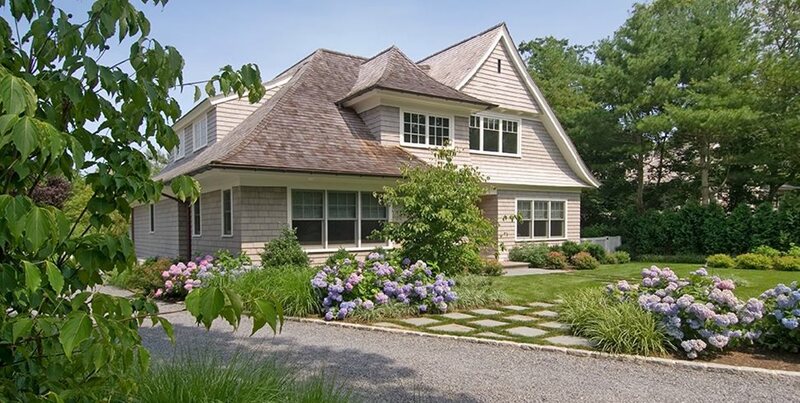 This Hamptons landscape reflects the relaxed feel of a country garden. Notice how the shape of the pathway reflects the sweeping line of the roof for a feeling of continuity. Soft colors work best in a country setting. 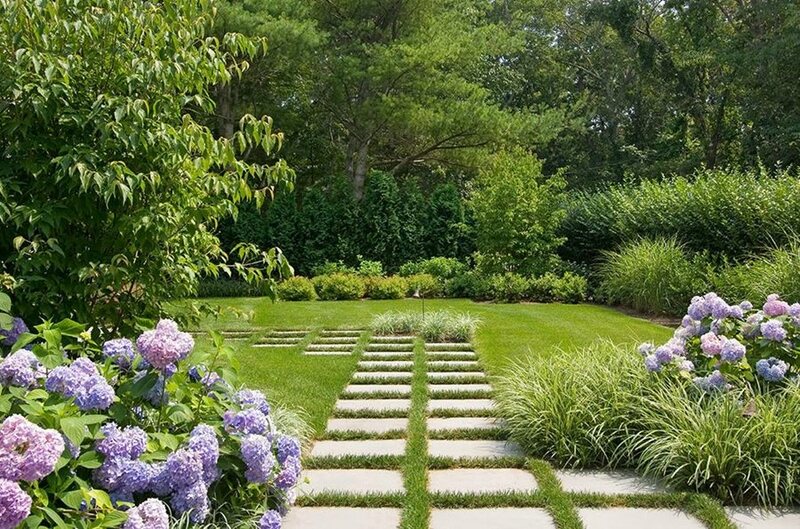 Here, hydrangeas provide color while low grasses cover the ground and prevent weeds. The muted tones and simple beauty of boulders and foliage interest is emphasized in a country setting. A stacked stone wall fits well with a rustic setting. A connection with the land and the seasons is important in a rural setting. 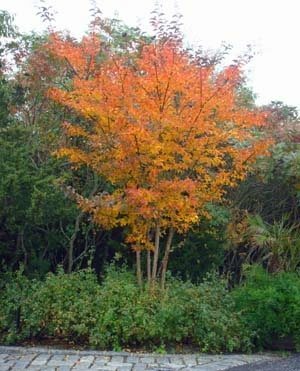 Here, a crape myrtle provides fall color. 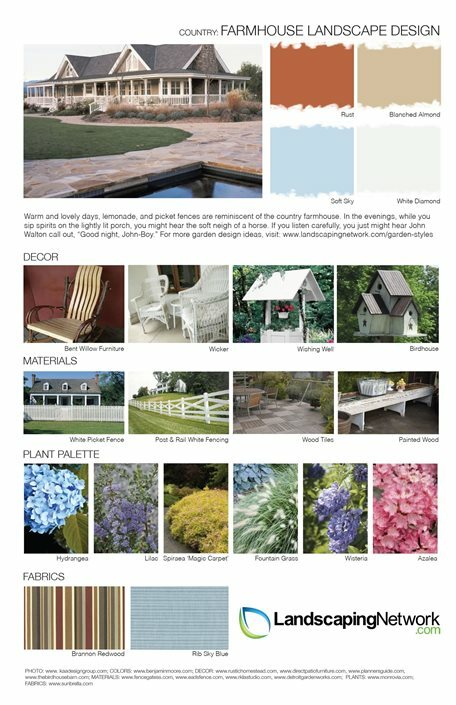 Use this design sheet to help you create the perfect farmhouse landscape. You'll get ideas for color, décor, materials, plants and fabric. 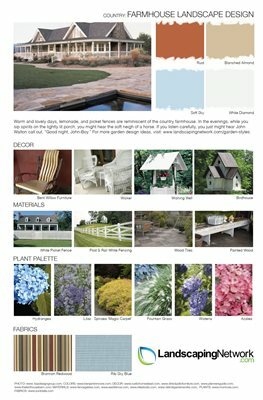 It is a great starting point for any country landscaping project. 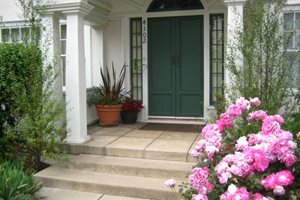 ** Emphasize plants local to your region to harmonize with your natural setting. 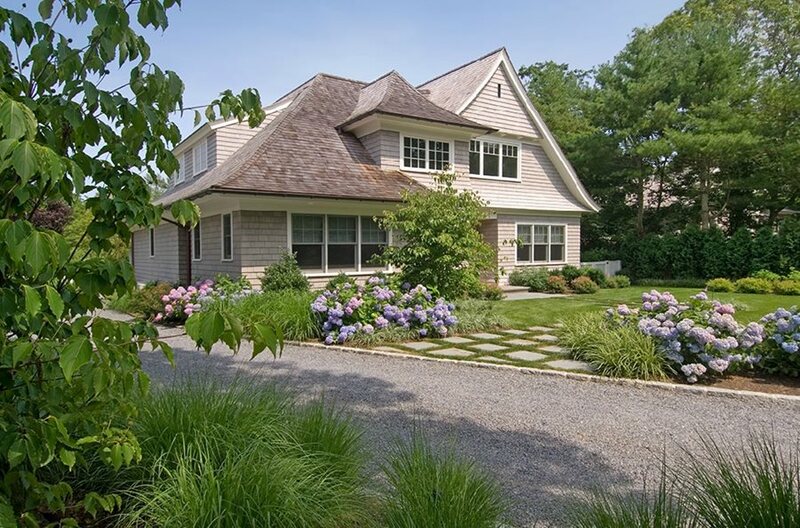 Landscape architect Barry Block feels the most important thing in designing for a country house is recognizing the specifics of your own architecture and setting. 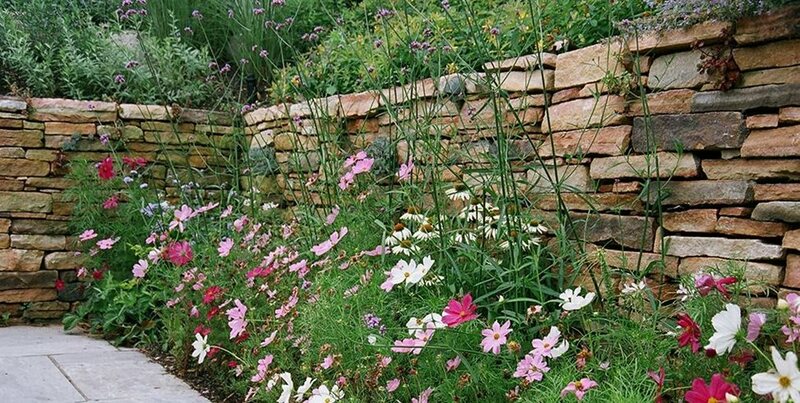 He's been creating beautiful landscapes for over 25 years, and here he shares his professional tips for creating a gorgeous country-style garden. Do look for lines in the architecture and land that can be repeated through the landscape. For example, the swoop of a roofline can be mimicked in the lines of a pathway to give the sense that home and landscape fit together seamlessly. 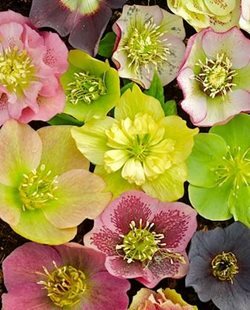 Do use a soft color palette in your planting and décor. White, light blue and the natural tones of foliage highlight the country theme best. Also, says Block, "reflect the colors from your interior and architecture within the landscape for a cohesive look." Do make the most of your views. 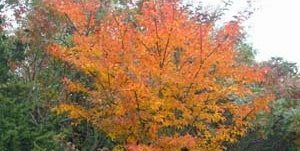 Plan your landscaping to enhance and draw the eye towards any pastoral scenes, beautiful trees, or rolling hills that may be visible from your property, both from inside the house and out. Do choose local materials and stone. A country home reflects its natural surroundings, so adding boulders, rock outcroppings, stacked stone walls or irregular flagstones native to your region will give your rural home the easy elegance that comes from fitting with the environment. Don't use plastic or metal edging. 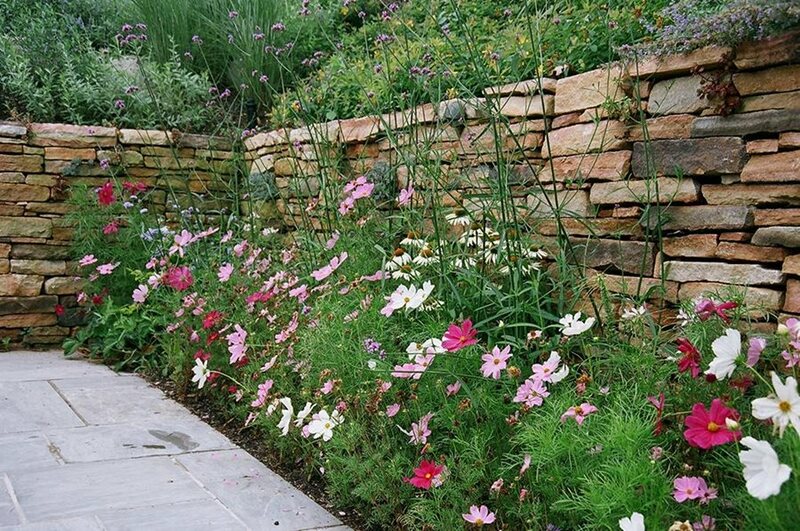 The natural style of a country garden is marred by introducing this manmade element into planting beds. 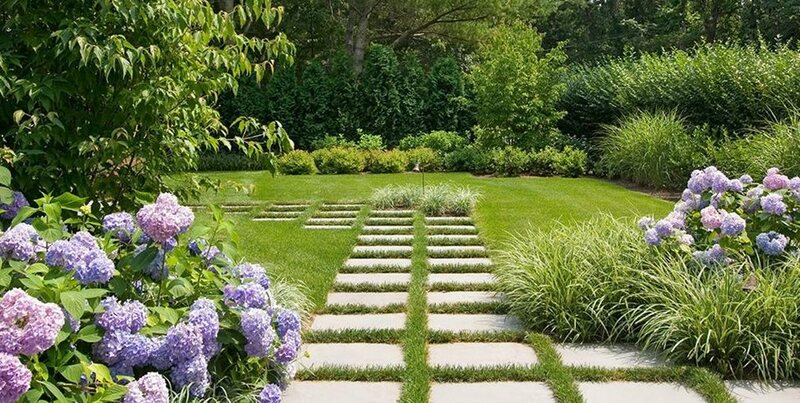 Instead, cut a deep edge between lawn and garden beds and maintain it with a line trimmer to keep borders looking sharp. 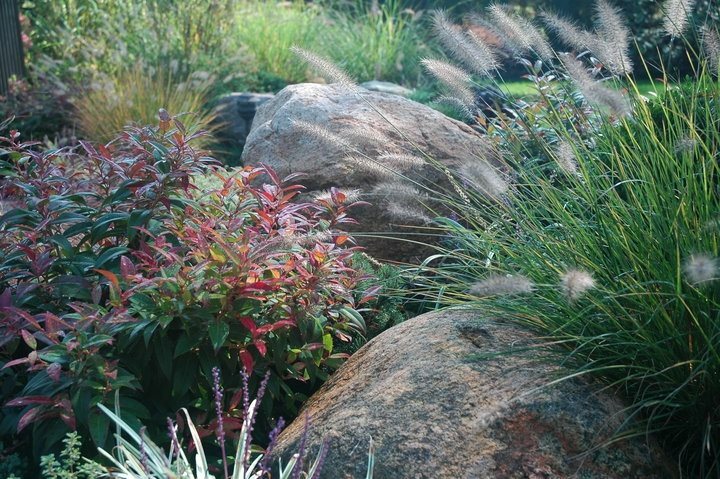 Don't neglect cultural requirements when choosing plants. 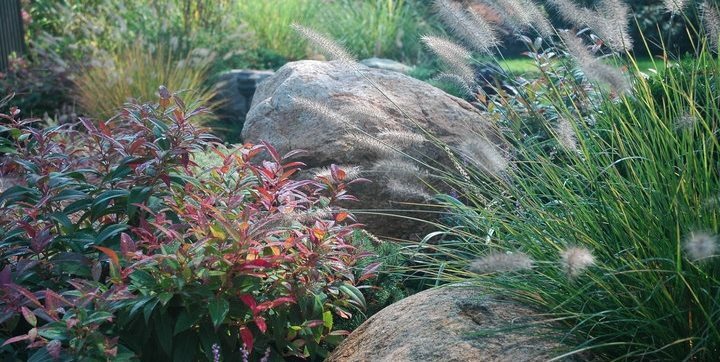 "It's been said before, but choosing the right plant for the right place is key in successful planting design," says Block. Paying attention to whether you have sun or shade, wet soil or dry, and then picking plants to suit can make all the difference in having a healthy, thriving landscape. Don't spend your weekends weeding. While topdressing with compost can help keep down weeds, "the best weed control is mass plantings of ground cover," says Block. 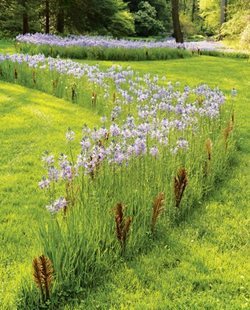 He suggests plants like Carex and Liriope which have a lush yet refined look. Don't select elements contrary to the farmhouse theme. Rustic elements like Adirondack chairs, built-in benches with cushions, and even old-fashioned oak barrels will fit better than sleek, modern décor. "Of course, the most important place to start in any design is with solid design principles," Block says. "Attention to how people will move through the space, and concepts like form, line, texture, balance and rhythm all play a part in that sublime sense that the landscape just feels right." While many people start planning a landscape by thinking about plants, Block first considers issues of structure such as what is happening in the architecture and on the land. 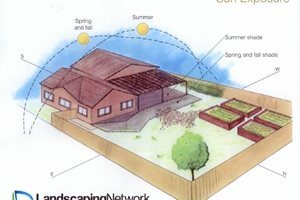 This results in a landscape that both looks beautiful and functions well. 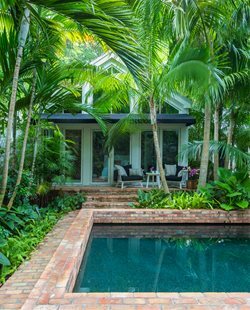 In his years as a landscape architect, Block has created a variety of custom landscapes perfectly suited to their environs. While each of his built landscapes shares similarities in the principles used to create them, each has its own character which comes from observing and acknowledging the specifics of the site. Block also owns Block's Nursery, a 20-acre nursery specializing in high-quality wholesale plants for the Suffolk County region of New York.